Hunter Springs works closely with OEMs in the aerospace, medical, trucking and transportation industries to develop custom spring reels for specific applications. 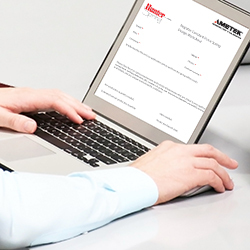 As a flat spring manufacturer, Hunter Spring has the experience and equipment to design and test very precise and specialized springs. We have been using the science in springs to solve challenges for OEMs for over 100 years. Use our design worksheet to specify your mechanical cable reel requirements and allow our Application Engineers to provide you a design to meet your needs. You can also contact us at hunter.sales@ametek.com and tell us what your needs are.